Flash Carts other : MagicKey 3 2006, SD/MMC, 2/16/512M + NeoKey + USB SlimLoader IV + 1G SD (128Mbyte) - SHOP01MEDIA - console accessories and mods, retro, shop - One Stop Shop! Neo MagicKey 3 2006 kit includes a lot. It doesnt require additional GBA flashcart to play games!Neo MagicKey 3 2006 kit includes a lot. It doesnt require additional GBA flashcart to play games!The MK3 is like a passme device. It also has the sd/mmc slot on it. It also has an internal flash for running roms directly from the unit. Its also possible to run roms (homebrew and commercial) from from sd or mmc memory or from a separate flashcart. With Mk3 2005 kit theres no more need of a additinal GBA flashcart to play games and run software (unlike the MK1/2/3 from 2005). The NEO-KEY is not for storing roms, only for storing menu software. The menu software is for browsing and running roms from the sd,mmc,mk3,or flashcart. 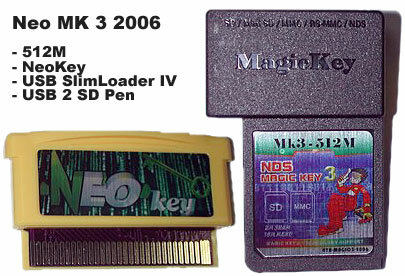 Using Neo-Key you dont have to use another flash cart as you had to do with older MK1/2/3 (2005). Note: The Neo-Key can also be used with those older MK 1/2/3! MK3 2006 has built-in 16M menu flash + 2M buffer (not for saves) and can upgrade the booting code through the MK2/3 menu software (On-The-Fly upgrade function avalible soon in menu software v0.7). The new USB Slim Loader IV suports updateing the Neo-Key menu. Memory moduls can be ordered separatly here.